Here at 40NORTH Restaurants our culinary and mixology teams are always looking to create new and exciting dishes and drinks that incorporate seasonal ingredients, especially in the summer months! 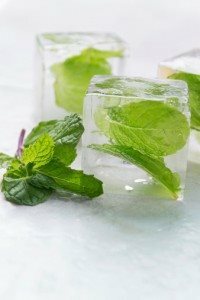 Freeze herbs, fruits or veggies in ice cube trays and serve them in water. Not only are they refreshing, but they make for an artful drink. Try a blend of cucumber, basil and salt; orange juice, lime juice and lime zest; or sugar, lemon juice, raspberries and mint sprigs. For recipes click here. Sprinkle a tomato sauce-less pie with fresh peaches, olive oil, balsamic vinegar, Gorgonzola cheese, mozzarella cheese and chicken breast. This recipe is simple to make at home because it involves using a premade crust, a la Boboli. It’s also a quick meal—you can whip it up in 20 minutes. See the recipe here. You can’t go wrong with a healthy and refreshing salad like this one. Toss together crunchy jicama, cut into matchstick pieces; watermelon chunks; and torn mint leaves, and coat with fresh orange juice, fresh lime juice, honey, black pepper and kosher salt. Click here for the recipe. Have fun with these last few weeks of family fun. Enjoy!